This is recommended by dermatologist and it is clinically proven to relieve dry skin. The Aveeno lotion moisturizes for 24 hrs. It's fragrance free with natural colloidal oatmeal, which means anyone allergic to fragrances could use this without having an allergic reaction. 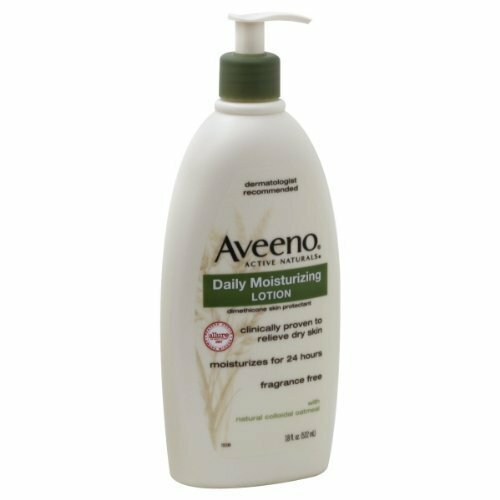 The Aveeno lotion is nourishing, non-greasy and absorbs quickly. This contains no added fragrance. The oatmeal formula locks in moisture to help prevent and protect dry skin. This leaves your skin feeling soft, smooth, and naturally healthy looking. I love how the Aveeno lotion is non-greasy, because I don't like how other lotions make my skin feel sticky afterwards. Also this product absorbs quickly into the skin, which is a plus. I mean who wants to wait five to ten minutes for a product to soak into the skin. I do recommend giving this a try, especially if you experience dry skin. I hope you enjoyed about the Aveeno Moisturizing Lotion!